Sherry has been visiting Winnipeg as a playwright being fêted at the city's annual FemFest, and she had been there a few days when Jeem showed up. Just in time to visit the University of Manitoba for a reading for students and faculty in theatre studies. 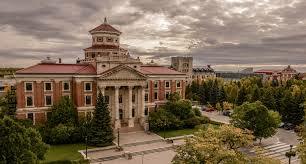 Established in 1877 the University of Manitoba was the first university in western Canada. Today it has over 27,000 students. And some of those students were at the John J. Conklin Theatre at the UofM last Friday for a reading and Q&A with Sherry MacDonald. She was introduced by Bill Kerr. The reading was organised in part by the UofM's Black Hole Theatre Company, and Sarasvàti Productions. And with readings from two completely different plays, one comedic, the other dark, the faces of the playwright add to the experience.